Netanyahu ridicules Joint List MKs over their support for Hezbollah: "Did you fall and hit your heads?" 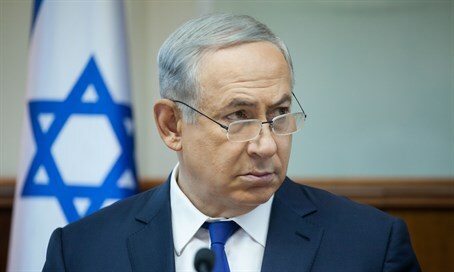 After Arab lawmakers from the Joint List faction issued statements condemning the labeling of Hezbollah as a terrorist organization, Prime Minister Binyamin Netanyahu expressed astonishment Monday evening at the support for the radical Shi’ite terror group. The controversy erupted following a decision last Wednesday by the Gulf Cooperation Council to designate Hezbollah as a terror group. The council represents Saudi Arabia, Bahrain, Kuwait, Qatar, the UAE, and Oman. Hezbollah, an Iran proxy which has attacked both Israel and Western targets and is heavily involved in the Syrian civil war, is also believed to be responsible for the bombing of a US Marines barracks in 1983 that killed more than 300 people. On Monday, both the Hadash and Balad parties within the Joint List issued formal condemnations of the decision by Arab Gulf states to recognize Hezbollah as a terror group, saying the designation was unjustified and “could serve Israel’s interests." Netanyahu mocked the Arab MKs’ support for Hezbollah as “amazing," noting that as Israeli citizens, they’re potential targets. “Will you still condemn [the designation] when Hezbollah is shooting missiles at your villages? Do [you think] they will distinguish between [your] blood and ours?," said Netanyahu. Minister of Transportation Yisrael Katz (Likud) also responded to the Joint List's statements saying "It's simply unbelievable that Knesset members would harm Israel's interests." Katz compared the Joint List's leadership to disgraced former MK Azmi Bishara, the founder of Balad who defected to Syria in 2007 after it was revealed he had provided technical support to Hezbollah during the 2006 war with Lebanon, when he guided its missiles to hit Israeli civilians.